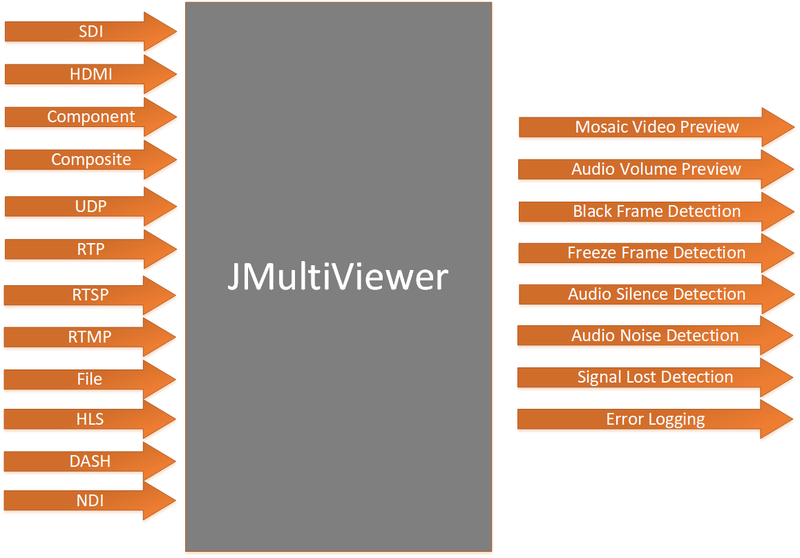 JMultiViewer is an intelligent multiviewer solution for video and audio preview and monitoring.The multiviewer supports SDI, HDMI, Composite, Component, NDI, HLS (HTTP Live Streaming), TCP, HTTP, UDP, RTP, RTSP and RTMP inputs. Both live network input and file-based input are supported. Seeking preview in file mode available. Adding and removing channels on-the-fly. In the multiviewer the supported container formats for file-based and IP input are MPEG Transport Stream – single and multi program streams, MXF, MP4, AVI, AVC, MPEG-2, AAC and MPEG Audio. Audio real-time volume level preview for up to 32 audio mono channels is available. Display of current position and duration for the file-based streams. Detailed audio and video streams format information. Audio, video and signal quality multiview monitoring functionality is available. The multuviewer monitoring option supports automatic detection of black frames, freeze frames, noise, audio silence and signal loss. It also has instant error logging and e-mail notifications on detected errors. Presets for prompt start of pre-configured set of files, streams or hardware inputs are available. 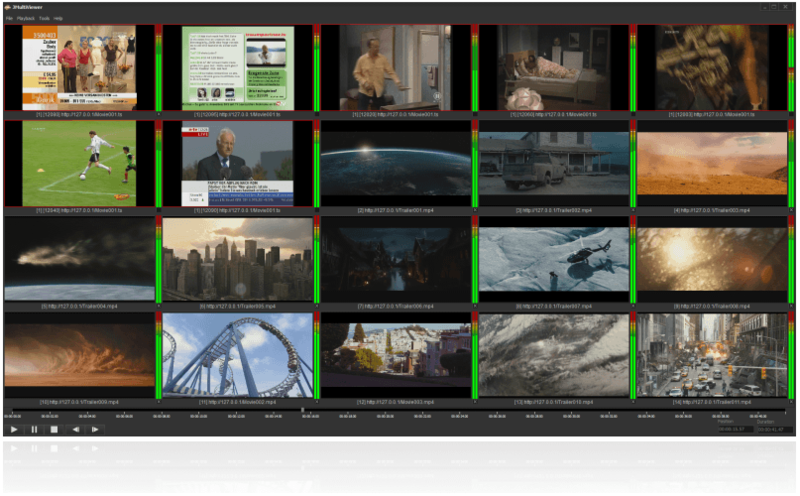 JMultiViewer Free is a freeware version of the standard JMultiViewer solution, allowing up to 4 monitoring channels. The free solution supports SDI, HDMI, Composite, Component, NDI inputs. Adding and removing channels on-the-fly is also available. Find out more about the JMultiViewer Free here.